Jadu’n is one of the Shifting Isles, originally part of the southern coast of the land before the Breaking of the World. The Isle is a valley almost entirely below sea level, the ocean spilling over its rim, thus earning the Isle its nickname, The Hole in the Ocean. Jadu’n is home of the magi, and Father Kalos, the creator of Man and magic, is its patron god. The Isle is a magical paradise, full of lush gardens, intricate stonework, and stained glass. It is a place of quiet study and contemplation, where the magi live and train. The Isle is so charged with magic that it creates a sort of haze around the Isle’s rim, making it difficult for sailors to see until they’re close enough to the Isle, leading to the occasional incident of a ship running into the Isle’s rim. Floating above the center of the valley is a detached hill where the Grand Temple is built, the home of Jadu’n’s ruling council, the Vakti. The Ladies of the Vakti have supreme governing power on Jadu’n, and are in charge of certifying the magi once they’ve passed their trials. Though all magi are men, the Ladies do have a small degree of magic, confined to the ability to sense the birth of a new mage in the world so that the magi can be sent to notify the child’s family of his gift and extend an offer to study on Jadu’n. The magi themselves come from all walks of life, the mage gift assumed to be a random, genetic anomaly since it has never been determined why certain men are born with the gift while others are not, nor why only men have ever been magi. The only race from which no magi have ever come is that of the Falsiners. However, the Ladies of the Vakti have all been Falsiner women (runt Falsiner women, to be precise), though they have yet to understand why. Many of the magi have one particular aspect of magic to which they are especially attuned. For instance, one might be a healer, while another may be prone to prophecy, and another may be skilled in records and map-making (known as inkdancers). Almost all of the magi are gay. The magi ranks are as follows: sarthi, or novice, designated by their brown robes; siksani, or priest, designated by their blue-grey robes (siksani are more advanced than sarthi but not fully certified); and rajali, or fully-certified mage. They refer to non-magical persons as navi. The only known magical creatures in the world are the beykana, a white, winged horse that originates from Falsin, where they are bred and sold to Jadu’n. The beykana choose their riders (how, the magi have never determined), and once the bond is formed between mage and mount, the horse begins to take on a unique color pattern, turning it into a renkana. 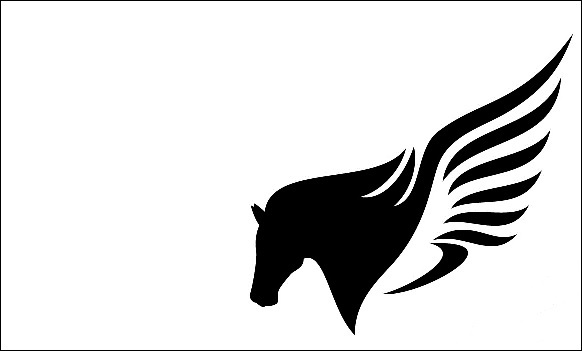 The beasts, being exclusive to the use of the magi, are the basis for Jadu’n’s flag: a stylized drawing of a winged horse in black on a background of white.